Dr. Mark Sklansky, a self-described germaphobe, can't stop thinking about how quickly microbes can spread. "If I am at a computer terminal or using a phone or opening a door, I know my hands are now contaminated, and I need to be careful and I need to wash my hands," says Sklansky, a professor of pediatrics at the David Geffen School of Medicine at UCLA. Not all health workers are so careful, despite strict handwashing policies in virtually all medical facilities. A 2010 study published in the journal Infection Control & Hospital Epidemiology shows that only about 40 percent of doctors and other health care providers comply with hand hygiene rules in hospitals. Hospital-acquired infections are a serious and potentially life-threatening problem. On any given day, 1 in 25 hospital patients suffers from at least one infection acquired while they are in the hospital, according to the Centers for Disease Control and Prevention. And studies show the hands of health care workers are often to blame. 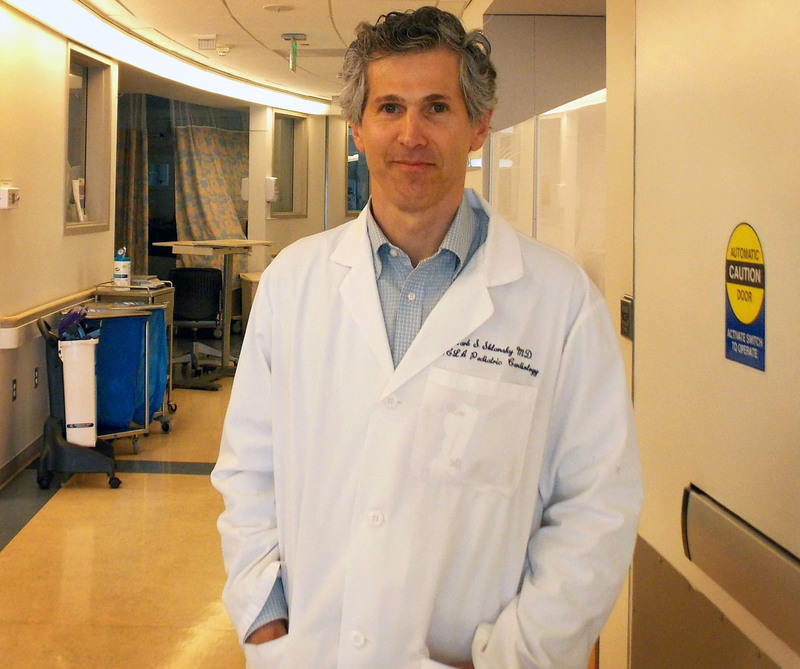 Mark Sklansky, a pediatric cardiologist and self-described germaphobe, tested a new method for limiting the spread of germs: a handshake-free zone. He tested it in two UCLA neonatal intensive care units. So Sklansky decided to test a new method for limiting the spread of germs and reducing the transmission of disease in the hospital: a handshake-free zone. "We are trying to do everything to minimize hospital-acquired infection except for the most obvious and easiest thing to do, in my opinion, which is to stop shaking hands," he says. Sklansky doesn't believe this is a substitute for handwashing, but he does think reducing handshakes could help cut down on the spread of infection. He first proposed the idea in a 2014 editorial published in the Journal of the American Medical Association. His proposal launched a lively debate about the possible risks of the time-honored greeting. Then in 2015, Sklansky decided to try out the idea with a six-month experiment. He picked a place where patients are especially vulnerable — the neonatal intensive care unit at two of UCLA's hospitals, one in Westwood and one in Santa Monica. Infections among infants can cause them pain, prolong their stay in the NICU, require more medications and even put their lives at risk. Staff and families in the units were told the reasons for dropping the handshake. And signs were posted designating the new handshake-free zones. 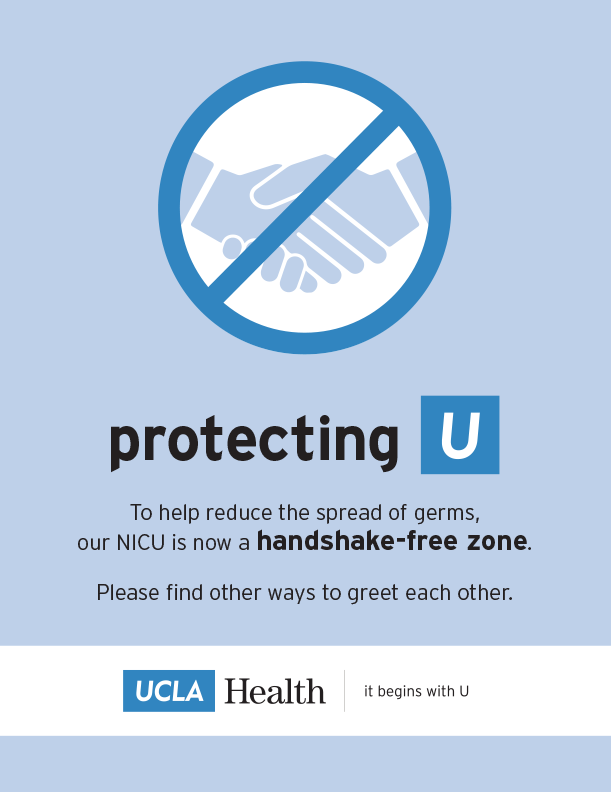 The signs feature two hands gripping each other inside a circle with a blue line through it and the words: "To help reduce the spread of germs, our NICU is now a handshake-free zone. Please ﬁnd other ways to greet each other." Instead of a handshake, non-contact greetings like a bow, a wave, or a smile are encouraged. Other greetings include options like a fist bump, a bow or a wave. Handshakes weren't banned outright, but it was recommended that a smile or another non-contact form of salutation like a Namaste gesture might be better. "We aren't like a military operation," says Sklansky. "We are just trying to limit the use of handshakes." 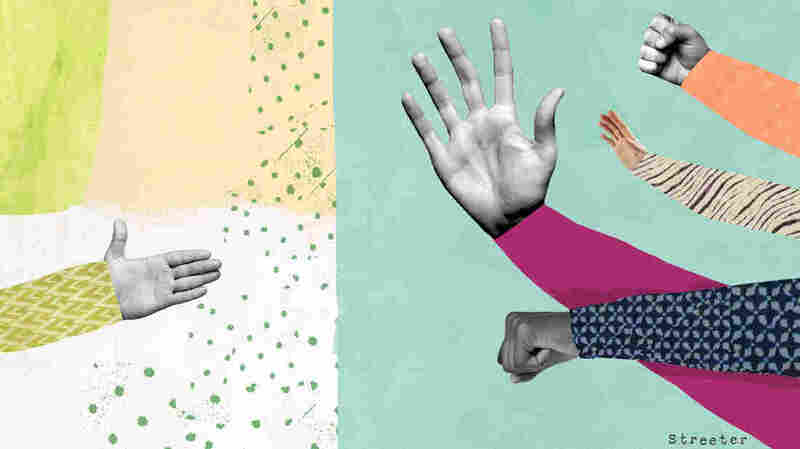 In a survey of staff and family members about the experience, Sklansky and his colleagues found that establishing handshake-free zones does reduce the frequency of handshakes. And most health care workers support the idea. The findings were published in the American Journal of Infection Control. The survey didn't determine whether avoiding handshakes actually reduced the rate of infections, but Sklansky hopes to answer that question in a future study. The formal experiment is now over, but the signs in the NICUs remain. And doctors and nurses still discourage handshakes. It's is an effective way to decrease the spread of germs, says Maureen Shawn Kennedy, editor-in-chief of the American Journal of Nursing. "There are just so many reasons to avoid handshakes, even when people are washing their hands," Kennedy says. "Just because someone is walking around in a white coat [...] doesn't mean they don't have bacteria on their hands." Health care providers do wash their hands frequently, she says, but often they don't do it for long enough or use the right technique. And bacteria live on computers, phones, medical charts and uniforms throughout hospitals, she notes. Although there is no data to prove that reducing handshakes limits hospital infections, one study showed that bumping fists was more hygienic than shaking hands. However, some infectious disease specialists believe health care workers don't need to stop shaking hands. They just need to scrub better. "The problem isn't the handshake: It's the hand-shaker," says Herbert L. Fred, a Houston physician and associate editor of the Texas Heart Institute Journal. In a 2015 editorial he urged doctors to ensure their hands are clean before touching patients. After all, he wrote, "If we ban the handshake, we might as well ban the physical examination. Both practices can spread germs," — if you don't wash your hands properly. Handshake-free zones are not the solution for hospital-acquired infections, according to Didier Pittet, director of infection control at the University Hospital of Geneva. They simply "reflect the lack of capacity in infection prevention and control," he wrote in an e-mail. Sklansky agrees that hospitals need to improve compliance with hand hygiene. He says handshake-free zones aren't designed to replace hand washing but to complement it. "I actually think handshake-free zones will bring attention to the hands as vectors for disease and help improve compliance with hand hygiene," he says. Neonatologist Joanna Parga, who was part of UCLA's handshake-free survey, says she liked the idea when she first heard about it, but wasn't convinced it would work. Shaking hands is "so ingrained in our culture," she says. And it is how many doctors connect with patients. New mom Brittney Scott said she'd never heard of a handshake-free zone and wasn't sure about the idea. "But once you really understand the meaning behind it, it's great," she said. After trying several alternatives to shaking hands, including bowing, making eye contact and touching people on the shoulder, Parga now believes some of these other options are more intimate than a handshake. And they open up a conversation about safety, she says. On a recent afternoon, as Parga walks through the Westwood NICU, she introduces herself to a mother holding her infant son. "Hi. I'm Dr. Parga," she says. "Are you Mom? I'm not gonna shake your hand." Parga explains she's just trying to help prevent infection in the NICU. Not shaking hands can feel uncomfortable, says Meena Garg, a neonatologist and medical director of the Westwood NICU. Patients often extend their hands in greeting, so sometimes "you feel like you are being rude," she says. But Garg supports the handshake-free zone, because it is an easy and inexpensive way to reduce infections. "I am the medical director, so I have to look at costs," she says. "This doesn't cost anything, but it may be just as important as anything else we do." As part of the UCLA survey, Sklansky and his colleagues asked staff and parents what they thought of the new handshake-free zones. The majority of health care workers support the idea, especially medical school students and nurses. Male doctors are the most resistant, partly because they aren't convinced stopping handshaking is necessary to prevent infections. Families, however, are universally supportive of the handshake-free zones, Sklansky found. On one recent day, Brittney Scott stands beside the crib of her 2-week-old son, Samuel, as he sleeps. He's in the NICU because of intestinal problems. Scott had never heard of a handshake-free zone, and instinctively offered her hand to a doctor when she first arrived. She was "a little taken aback at first" when the doctor declined to take her hand. "But once you really understand the meaning behind it, it's great," Scott says. Scott knows Samuel is at risk of infection, so avoiding germs is critical. She now prefers a smile to a handshake. "A smile goes a long way in here," she says. "There's a lot of ups and downs [...] being a parent to a NICU baby."